There have now been a sufficient number of in vivo tractography studies of language-related areas to discern the general patterns of connectivity between Broca's area and the temporal lobe. In vivo tractography is achieved using diffusion tensor imaging (DTI) which is sensitive to the direction (orientation) of water molecule diffusion. Because water diffuses more readily along myelinated fiber tracts DTI can be used to map white matter fiber projections. Like fMRI, DTI findings are highly dependent on the details of how the data are analyzed, e.g., how the seeds are selected, whether you average across subjects or not, etc. So, like fMRI I think any individual study needs to be interpreted cautiously until similar patterns start showing up across studies/labs/methods. I recently looked at four published studies to see if there were any patterns that emerged. The figure below is my summary of what these studies showed. All of them distinguished between anterior and posterior sectors of Broca's area, the pars triangularis (PTr, ~BA45) and pars opercularis (PO, ~BA44), and two studies distinguished a third region referred to as the deep frontal operculum (DFO). It is not yet clear to me where this DFO is exactly; more on that later. Two of the studies differentiated temporal lobe regions into a dorsal site, the superior temporal gyrus (STG) and a more ventral site, the middle temporal gyrus (MTG). There is clear evidence for two pathways, a dorsal pathway corresponding to the classic arcuate fasciculus link between Broca's and Wernicke's areas, and a ventral pathway that projects through the anterior temporal lobe and into the inferior frontal gyrus via the uncinate fasciculus and/or the extreme capsule. The figure below shows the dominant connections reported in each study. Lines are color coded by study so that where there are more lines between two regions we can have more confidence that the connection exists (i.e., it replicated across more studies). For studies that didn't report a specific temporal lobe target, the lines to the temporal regions are left undetermined in the figure. There is clear evidence for a link between the STG and PO, the posterior portion of Broca's area. This makes some sense as both the STG and PO have been implicated in phonological-level processing. This link appears to be via the dorsal route. One study found that this relation may be mediated by a region in the inferior parietal lobe (IPL). It is tempting to think this may be Spt, but it is only one study, and this study did not specify the specific temporal lobe target. The pars triangularis has a different connectivity pattern. It has projections via both the dorsal and ventral route and where specified, it connects to the MTG. This also makes some sense as both the PTr and the MTG have been implicated in aspects of higher-level (e.g., "semantic") processing. The deep frontal operculum appears to connect with the temporal lobe primarily via the ventral route. 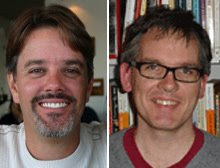 Some have suggested that the DFO plays a role in syntactic processes. I'm not so sure about this yet, but it is interesting that it projects through the anterior temporal region which also seems to supports some aspect of sentence-level processing. So what we seem to have is a hierarchical connection pattern between the temporal lobe and inferior frontal lobe. 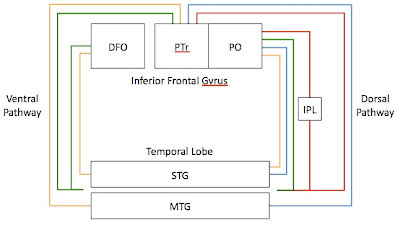 Temporal lobe regions that are closer to the auditory periphery connect with IFG regions that (may be) closer to the motor periphery (the STG-PO circuit), whereas temporal lobe regions that are doing some higher-order operations connect with higher-order IFG regions (the MTG-PTr circuit). I think connectivity studies are crucially important in helping to constrain theories of language organization. While tractography research is still in its infancy, this set of studies strikes me as a really great start. Thanks for a brief review. Have there been any studies examining the connections between inferior frontal gyri and limbic lobes in man?